Today in Masonic History Isaac Newton Blackford passes away in 1859. Isaac Newton Blackford was an American Jurist. Blackford was born in 1786 in Bound Brook, New Jersey. Blackford's father passed away in 1800. Blackford was enrolled in Princeton University at the age of 16 using money he inherited from his father's passing. Blackford graduated at the top of his class in 1806. In 1810 he completed his studies with George Macdonald, a Revolutionary War Hero and Gabriel Ford a member of the New Jersey Supreme Court. After taking one case on his own, Blackford decided that he needed to be part of a law firm and joined Macdonald's firm. In 1812 for an unknown reason Blackford headed west to the Indiana Territory. With a letter of introduction from Macdonald he quickly established himself in the territory. He would become one of only thirteen lawyers in the territory to pass the bar. Blackford would be appointed to the 1st Circuit of the territory when the governor reorganized the courts. He would hold the position until 1816 when Indiana would be granted Statehood. With Statehood came the dissolution of the territorial government, which included Blackford's position on the court. After losing his position in the court, Blackburn would run and be elected to the Indiana state legislature. He would serve only one year. Although there are no direct documents showing his involvement in creating the constitutions of the state, his position in the assembly as Speaker of the House would have put him in a direct position to influence the laws. 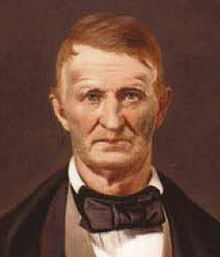 In 1817 Blackford was appointed to the Indiana Supreme court. One of his most important cases as part of the court was in 1820 Polly v. Lasselle. During the case Blackford freed all slaves held within the state of Indiana. In 1819 Blackford married the daughter of Macdonald. She was 14 years his junior which made for difficulties in the marriage. In 1821 they had a son and his wife passed away due to complications from child birth. At some point before 1827, the specific date is not available Blackford's son passed away due to an illness. In 1827 Blackford's mother passed away. This succession of tragedies weighed heavily on Blackford. During the time of his personal tragedies Blackford locked himself away from the world. He would start on his book called Blackford's Reports the first of which was published in 1830, there would be a total of 8 volumes. The books would include all of the decisions of the Indiana Supreme Court. The books would spread to Europe and would be used as a legal resource anywhere Common Law was used. Blackford was a member of Harmony Lodge No. 11 in Brookville, Indiana.